If you are looking for the ultimate and relaxation, this comfortable sling chair in natural color is perfect relaxation and leisure and makes an ideal addition to your patio, back or front porch or anywhere in your backyard. This hammock net chair is handcrafted that adds character and authenticity contributing greatly to the balance and strength of the swing chair. 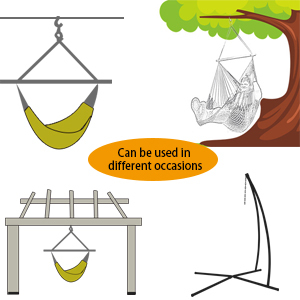 With its large metal and string loop at the top, it can be hanged with C-stand, inside the house, or on an airy porch, providing the comfort of a hammock paired with back and head support. It provides plenty of space for a large adult to stretch out and relax. You can use it like a standard chair for sitting, relaxing or reading, and you can also lay back and nap whenever you feel like it. It arrived assembled so all you have to do is hang it up and start swinging. This swing can also be used as a camping hammock chair. Place this striking seat to any outdoor vacation, such as camping, beach or mountain trips. It provides the ultimate comfort in outdoor seating and appeals to all ages. With zinc coated steel ring and handcrafted woven cotton rope, not only this hammock net chair looks beautiful, elegant,stylish and classic, but makes it support up to 300lbs for secure use. In that case, you can swing freely, no need to have any worries, enjoy the happiness and leisure time we bring you. The chair offers a high level comfort and durability. 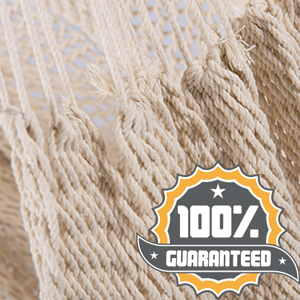 It’s crafted from 100% cotton rope that’s not only extremely comfy but it’s also designed for superior support and longevity. 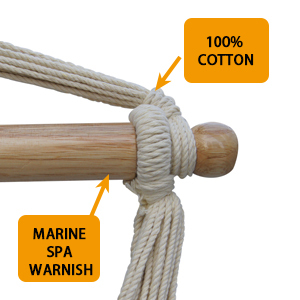 Also, the hand finishing cotton rope add character and authenticity to this hammock chair. The hardwood spreader bar with an oil rubbed finish is strategically placed to offer ease of access protecting from the elements offering even more stability, so with a weight capacity of 300 pounds, you will be able to relax by yourself or with a companion. This chair is the best!! My husband had a swing chair years ago and our son broke it by jumping on it repeatedly, so I have been looking for one to replace it for him because he loved it!!! When I surprised him with it as an early Christmas present he was so excited!!! And so was my youngest son! (Not the son who broke the other one, lol) I might even have to borrow it and hang it outside next summer ?? I love this! My kids and I think it¡¯s so fun, we are fighting who gets to sit in it. The wood is a very nice finish and the netting is a nice design. I¡¯m looking forward to putting it outside when spring comes, but meanwhile, I¡¯m ordering a frame so we can put it in the room of our choice. Love this, would buy again. We put this in my son's room and it's very comfortable and fun! It's too bad this did not come with anything for hanging it. We definitely needed additional rope so it wouldn't hang so close to the ceiling and my hubby had to figure out what to buy for hanging this, I wish it had come with all of that, especially so it would match but not a big deal for us. I love it! I received today and I am already ordering 2 more for my leaving room. I add 2 pillows from Ikea and looks perfect. It is very comfortable for reading. When I finish my backyard I will order more. I hope they will have in other colors for the same price. Very comfortable, especially because you can fully stretch your legs in it (unless you're 6ft+) . 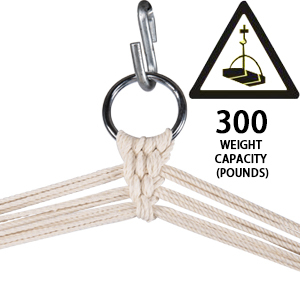 It's also nice that it's mostly made from natural materials (rather than polyester ropes or plastic bars). I love this hammock bc it doesn't take up my whole porch. I can comfortably sit in it upright or stretched out relaxing. The material isn't rough or scratchy and the colors are just as shown. I finally got my hammock chair hanging this past weekend and it's amazing. You will need a tall limb to hang this from! Bought 2 & love them. Well made, large, very colorful & best price I've found. Great colors, just like the picture, but even better. I haven't hung it up yet, but the wood and hardware appear to be very high quality and safe. I can't wait to use it once our new fencing goes up.